Well, it's happened. Maybe a tad sooner than I thought it would, but the off-season blues have set in. And as the frequency of my posting may be noticeable, at least for the next month or two, rest assured that we're not going anywhere. Lets face it, it's really easy to blog during the season. But it's not easy at all to blog with the same eagerness and fervent in times when there's really nothing going on. But there are a few things to look forward to in the coming months. You get the idea. But since we're a blog and make our living off of actual news, we're really at the mercy of what comes out of Ann Arbor. Last year was a crazy off-season. We had Lloyd's retirement, Les Miles, Rich Rodriguez, Terrell Pryor, Mike Barwis, etc...etc...etc. So it's safe to say that this year it will be a bit more tame. So hopefully that will give me the time to look into doing a full-site overhaul. Not just a redesign, but a whole fully-functional full-featured website with news, stats, analysis, multimedia...you name it. That's the plan in the hopper right now. Of course the blog will still be the main focus of the site. 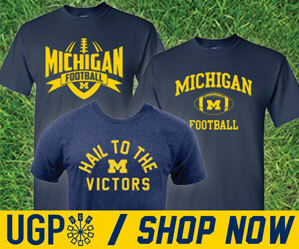 But it would be great to make Maize & Blue Nation more of a one-stop-shop, so to speak. But going from idea in my head to actual working site is quite a process. We'll keep you updated. So, we have a few posts on the way. Stay tuned.